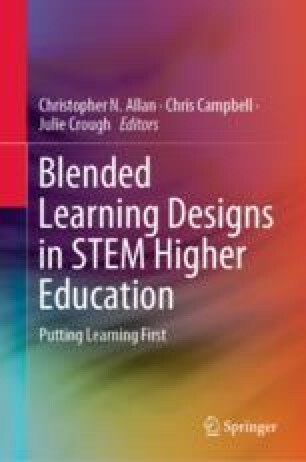 In this chapter, we will describe the approach taken to design a new first-year core course for a multidisciplinary STEM student cohort. This cohort presented challenges in terms of size, location, interest, understanding, and existing knowledge. We drew on the lessons learned from a previous redesign project for a course that shared many of these attributes to develop a course structure and approach to address these challenges. The design of the material, supporting technology, assessment, and class activities was structured to both support student learning and engage students in the learning process through a blended classroom approach and an active learning strategy. We utilised tools within the Blackboard learning management system together with the PebblePad platform for interaction to blend course elements. We followed a formal evaluation process and identified that the module and workshop structure implemented in this design were successful in supporting student learning of complex material. We observed that the quality of student work generally improved across the teaching period. Evaluations identified issues with the use of the PebblePad platform in terms of limitations for collaborative work and restrictions for document preparation. We have found that it is difficult to consistently engage with all students, and we will expand our approach to incorporate digital responses to questions and surveys with improved ability for the students to capture their own learning locally. Potential platforms to support these activities are the university native polling tool jPoll, the PebblePad platform, and the Echo360 Active Learning platform. Bonwell, C. C., & Eison, J. A. (1991). Active learning: Creating excitement in the classroom. School of Education and Human Development, George Washington University. Retrieved November 10, 2018, from https://eric.ed.gov/?id=ED336049. Koper, R. (2005). An introduction to learning design. In R. Koper & C. Tattersall (Eds. ), Learning design: A handbook on modelling and delivering networked education and training (pp. 3–20). Berlin/Heidelberg: Springer-Verlag. http://doi.org/10.1007/3-540-27360-3_1. Potter, L. E. (2018). A day in the life: An interactive application to introduce IT students to the workplace. In Proceedings of the 2018 ACM SIGMIS Conference on Computers and People Research (pp. 138–142). http://doi.org/10.1145/3209626.3209716. Topi, H., Valacich, J. S., Wright, R. T., Kaiser, K. M., Nunamaker, J. F., Sipior, J. C., & de Vreede, G. J. (2010). Curriculum guidelines for undergraduate degree programs in information systems. Retrieved November 26, 2018, from https://dl.acm.org/citation.cfm?id=2593310.